There is a promising new blog _urb_ which focuses on all things urbanism - including a lengthy post on AgroURBanism, which is defined as follows: "There have been many proposals in the last couple of years for different types of agricultural based infrastructures that can be integrated into nurban areas, what I am calling AGRO-URBANISM. The impetus for these proposals are manifold and include the concerns previously mentioned as well as issues of sustainability and sustainable development, a re-positioning of the landscape architecture discipline and the rise of the hybrid discipline “landscape urbanism”, and recent trends in architecture focusing on performance-based design which derive inspiration from ecological and biological systems." 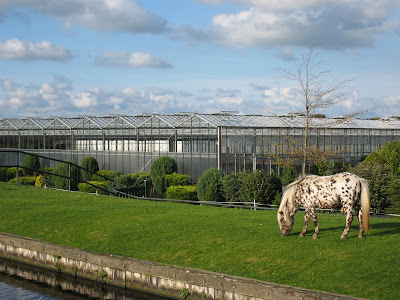 This concept of agro-urbanism fits squarely into the many trends discussed previously here, here, here, and here, related to city farming (with a much catchier title...) and continues the dialogue of methods for urban agriculture. This is not necessarily new information, but starts to pull it all together in a reasonable form for consumption. The site breaks these down into Horizontal Projects, Vertical Projects, and Mobile Projects - encompassing some of the variations on the theme. Looking forward to seeing more. "Agricultural Urbanism (AU) is an approach to integrating growth and development with preserving agricultural resources and enhancing elements of the food system. The cornerstone of AU is creating an urban environment that activates and sustains urban agriculture with important elements such as educational programs, small-scale processing opportunities and a farmers’ market or other local sales conduits. AU offers an alternative to the practice of separating places where people live and where agricultural activities occur. Central to the concept of AU is the idea of integration not separation, transitions not buffers." Recently Edible Estates: Attack on the Front Lawn was published - and has been getting a lot of interesting and gushing press for something that is not necessarily new or terribly innovative - just a reinvention of an old idea - but is nonetheless an important concept. I'm really interested in the essays, particularly those included from Diana Balmori and Michael Pollan. Look for a review soon. 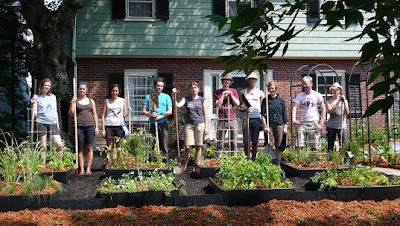 This idea for transformation of single-family yards from lawn to vegetables is laudable and important. 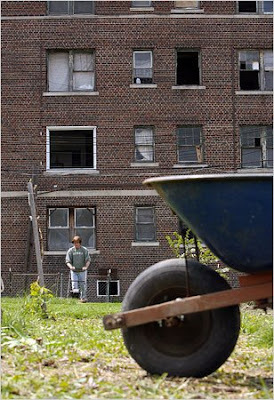 Perhaps looking at localized production and distribution in urban areas with less private land is even more vital. 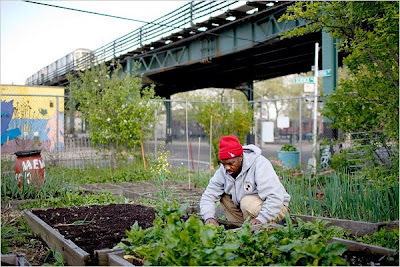 An article in the NY Times 'City Farmers' Crops Go from Vacant Lot to Market' looks at this in terms not just of self-sufficiency but as a way to feed the surrounding community. 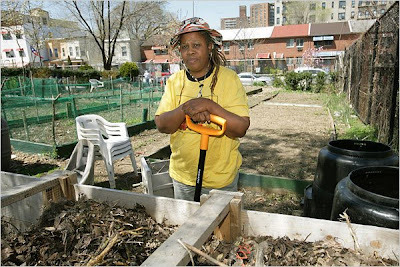 "For years, New Yorkers have grown basil, tomatoes and greens in window boxes, backyard plots and community gardens. But more and more New Yorkers like the Wilkses are raising fruits and vegetables, and not just to feed their families but to sell to people on their block." There are steadily increasing education and incentives, but mostly this momentum comes from the people themselves - many of them whom have gardening experience that they are applying to available plots of land in the city. From NYT: "Local officials and nonprofit groups have been providing land, training and financial encouragement. But the impetus, in almost every case, has come from the farmers, who often till when their day jobs are done, overcoming peculiarly urban obstacles." A more focused example of this is from Bogota, Columbia, where overcrowding has created food shortages that could potential lead to the same unrest seen elsewhere. A program akin to the parable about giving a man a fish, or teaching him to fish', this government program provides food and farming skills to combat hunger. 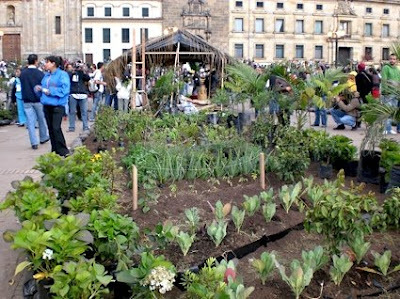 From Latinamerica Press: "Claudia Marcela Sánchez, the coordinator of Bogota mayoralty program that has trained over 40,000 of city’s residents in urban agriculture. “You can’t compare it with traditional agriculture, which has the aim of generating income,” she says. “This program has goals of building social fabric, and of appreciating agricultural practices.”Teams of agronomists have taught vulnerable citizens how to cultivate vegetables and herbs in limited spaces, from small allotments to fizzy drink bottles and wall crannies." 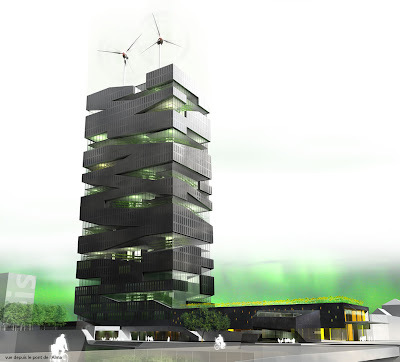 While not as down and dirty as an inner-city farm or hunger-relief in Columbia, an interesting project with a more artistic entry from Inhabitat. 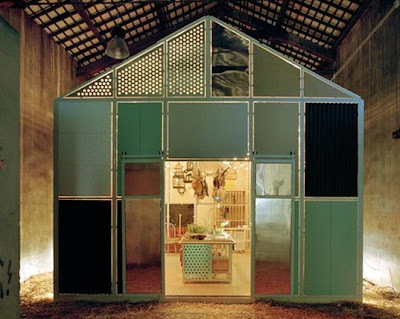 The Farm Project by Mike Meiré features: "...barn-like, “real-life” stage is charged with aromas, animals, plants and objects housed with an archetypal rural building with an outer cover made of patchwork materials. 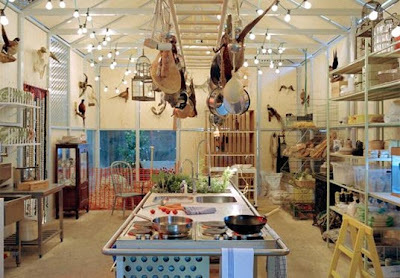 A beautiful exploration of design and living, The Farm Project shuns the “hidden” kitchen, enclosed in steel and stone, to connect people to that which sustains them." The coverage continues with some motivations. "Inside the smells, sights and hodgepodge of ‘home’ turn away from minimalist design and invite the visitor to “embrace the richness of life that minimalism had taken away. ... As a brand image campaign for Dornbracht, The Farm Project addresses the question of experience in the kitchen. Meiré’s idea of the kitchen is more a sense of place than a design directive. Messy and comforting, The Farm Project kitchen is a source of sustenance for more than just food." The crux of many of the 'agro-urban' shifts has to do with shifting from a more global food economy to a more local one. This involves reconnecting with both the methods of production, reinventing more DIY ideas, as well as continuing to increase awareness of 'foodsheds' and food miles travelled and how these, in tandem with peak-oil impacts, with have effects on our communities. What this local shift has done is made us more aware of the range of opportunities that exist (or can be created) throughout the urban fabric. We've mentioned the UK example of Middlesborough before, and a new article in the Guardian has hailed the use of public space for vegetables (on a grand scale) as perhaps the salvation for our food crises. The concept, to treat food production as a viable aspect of the communities infrastructure in order to maximize the opportunities. In this vein, a fair-trade, organic apple shipped from 1000s of miles away may be more healthy in specific terms. The power of 'Agro-urbanism' is it's ability to have the best of both worlds. Fresh, sustainable vegetables - available to rich and poor alike - and shipped the shortest distance possilbe, perhaps from right down the street.